The World Health Organization reports that unprecedented progress has been made in addressing 17 parasitic diseases affecting the world’s poorest populations. The public health authority attributes the gains, in large part, to the contributions of global partners, including drug contributions made by research-based pharmaceutical giants. The WHO released its second report on neglected tropical diseases, “Sustaining the drive to overcome the global impact of neglected tropical diseases,” on 15 January in Geneva. It says that ambitious goals to control or eliminate neglected tropical diseases (NTDs) entirely or in certain geographic areas by 2020 are within reach. Public health authorities give credit to a new strategy, which involves: endemic country ownership of national programmes; strong support from donors including the governments of the United States and United Kingdom, and the Gates Foundation; and medicines donated by some of the world’s biggest pharmaceutical companies. Neglected diseases are those for which there is little commercial market because they occur primarily among poor populations. NTDs refer to those involving parasites in particular. Some organisations that are not official partners of this NTD strategy, including Médecins Sans Frontières (MSF, Doctors Without Borders), caution that while drug donations are effective solutions for some diseases, it’s not enough to provide sustainable access to medicine for all people in need of treatment. The non-governmental organisation (NGO) also highlights an urgent need for improved, easier-to-administer treatments and diagnostic tools. “Market mechanisms do not solve the problem of access to treatment, even if it is out of patent, and these drugs are mostly, if not all, out of patent today. Access has not been assured of the drugs, in the quantity and quality that we have received,” Lorenzo Savioli, director of the Department of Control of NTDs at the WHO, told Intellectual Property Watch. Savioli cited the example of the prohibitive cost of praziquantel, a medicine produced by Merck KGaA (Germany) and used to treat schistosomiasis, for people most at risk of contracting the disease. The prevalence of the disease is highest in sub-Saharan Africa, according to the report. Therefore, he said that the donation made by Merck KGaA of at least 200 million tablets of praziquantel per year for distribution primarily to African children is a “crucial part” of reaching the WHO’s schistosomiasis targets. According to the WHO NTD report, at least 237 million people need treatment for s schistosomiasis. It is expected that the praziquantel donations will help reach 100 million people who need treatment per year. WHO NTD schistosomiasis targets include eliminating the disease in the Eastern Mediterranean Region, Caribbean, Indonesia, and the Mekong River basin by 2015 and in the Americas Region, the Western Pacific Region, and in selected African countries by 2020. In general, the distribution of donations is not limited by geography. But as the treatment outreach “is not intended to displace markets,” explained Denis Daumerie, project manager NTDS at WHO, the praziquantel donations are destined to Africa where it is not produced, and not China and Brazil, where there are government-backed manufacturing programmes. Other major targets include the global eradication of guinea worm disease by 2015 and yaws by 2020. Others are set for the control, elimination, or eradication of 15 additional NTDs either globally or for selected geographic areas. The release of the WHO NTD progress report comes one year after the London Declaration on Neglected Tropical Diseases [pdf], which was endorsed by Abbot, AstraZeneca, Bayer, Becton, Dickinson, Bill & Melinda Gates Foundation, Bristol-Myers Squibb, Drugs for Neglected Diseases initiative (DNDi), Eisai, Gilead, GlaxoSmithKline, Johnson & Johnson, Merck KGaA, MSD, Mundo Sano, Novartis, Pfizer, Sanofi, UKaid, USAID, and World Bank. Today, the London Declaration signatories have also released a report, which includes details on donor contributions and tracks partner outputs in 2012. Since the declaration, the research-based pharmaceutical industry announced the donation of 14 billion treatments throughout the decade to control or eliminate nine NTDs. “If all of these partners take to completion their commitment, in a little more than five years, we could celebrate a major win in public health. Our industry is on track with all the commitments made last year,” said Mario Ottiglio, associate director of Public Affairs and Global Health Policy at the International Federation of Pharmaceutical Manufacturers & Associations (IFPMA) during the press conference launching the report at the WHO on 15 January. 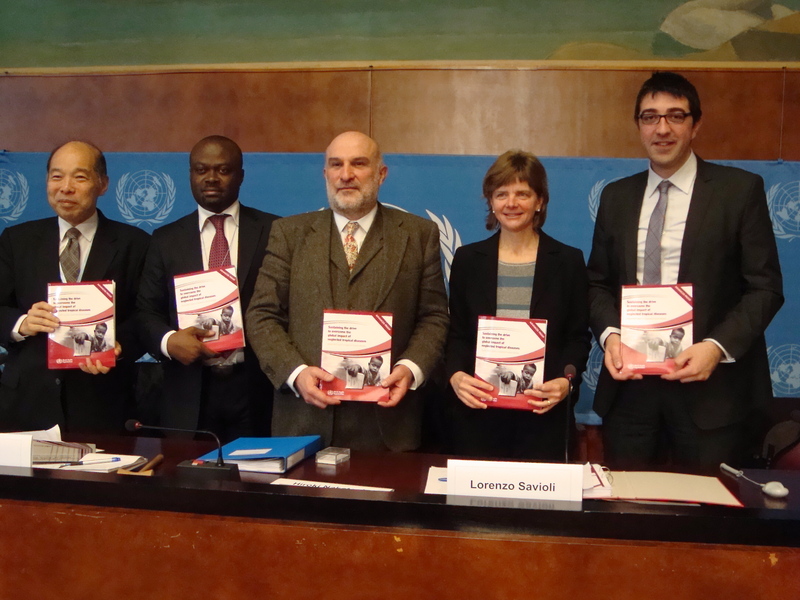 The industry group, which launched its own report on NTDs today, joined WHO on the press conference podium. There were no NGOs on the podium. Kris Easter, USAID representative from the US mission in Geneva, praised the collaborative approach that the WHO has adopted in addressing NTDs, “The progress that has been made in the past year under WHO’s leadership has been historic. In this era of heightened public and private cooperation, we applaud these achievements,” she said. Similarly, J.P. Tiémoko Moriko, counsellor from the Côte d’Ivoire mission in Geneva, congratulated the WHO for progress made and underlined the fact that NTDs are not confined to African countries, but affect populations across the globe during his intervention [pdf, in French]. Reacting to the NTD report, Julien Potet, policy adviser on NTDs at Médecins Sans Frontières (MSF, Doctors Without Borders) Access Campaign, took note of the “huge emphasis on drug donations,” in an interview with Intellectual Property Watch. “It may a good solution for some diseases, but for some others, drug donations have not been enough to facilitate access to treatment for all those in need. And alternative access strategies need to be explored and they are not explored efficiently at the moment,” Potet said. Last November, WHO member states agreed to endorse a work plan on coordinating, financing, and monitoring of R&D to address diseases that disproportionately affect developing countries. A divisive policy issue, the final output left some member states and NGOs hoping for a more ambitious strategy, namely a move toward a global convention on R&D, disappointed (IPW, WHO, 29 November 2013). Bernard Pécoul, executive director of DNDi, a non-profit R&D organisation, told Intellectual Property Watch that while the WHO report helps to “maintain visibility on diseases that that have been highly abandoned for many years,” the need for improved innovation in these disease areas remains high. “We know that with existing drugs it will hard to eliminate sleeping sickness because of the practical difficulties in administering the medication, especially in remote areas,” Pécoul said, also calling for improved diagnostic tools. Separately, the IFPMA launched a separate report [pdf] today showing a 40 percent increase over 2011 in pharmaceutical R&D programmes for NTDs. Again, public-private collaboration plays a key role with 85 percent of the projects listed in the status report born of a product development partnership (PDP). "Free Drugs Are “Crucial Part” Of Neglected Tropical Disease Fight" by Intellectual Property Watch is licensed under a Creative Commons Attribution-NonCommercial-ShareAlike 4.0 International License.